Format: Jigsaw Puzzle; UPC: 628136060752; MPN: 8500-0075; Brand: Eurographics; Pieces: 500 count; Size: approximately 19" x 27"; Series: Military Puzzle Collection. Condition: Like New. Purchased new and assembled once. ALL pieces are accounted for and still in excellent shape, and box looks great as well. Same box design as that shown here. 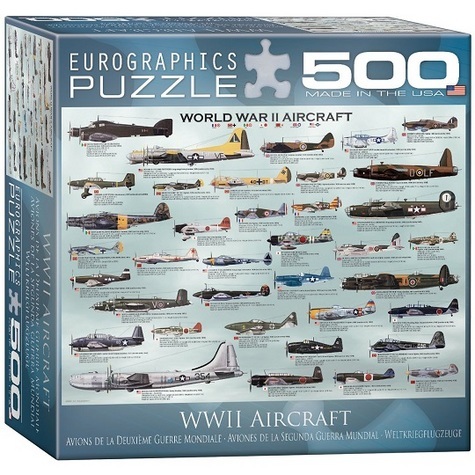 This unique jigsaw puzzle features aircraft of both the Allied and Axis forces, including many of the greatest warbirds such as the Hurricane, the Supermarine Spitfire, the Messerschmitt BF-109 and the Boeing B-29 SuperFortress.